Movie Textures are animated Textures that are created from a video file. By placing a video file in your project’s Assets Folder, you can import the video to be used exactly as you would use a regular Texture. Video files are imported via Apple QuickTime. Supported file types are what your QuickTime installation can play (usually .mov, .mpg, .mpeg, .mp4, .avi, .asf). On Windows, movie importing requires Quicktime to be installed. Download Quicktime from Apple Support Downloads. When a video file is added to your Project, it will automatically be imported and converted to Ogg Theora format. Once your Movie Texture has been imported, you can attach it to any GameObject or Material, just like a regular Texture. Your Movie Texture will not play automatically when the game begins running. You must use a short script to tell it when to play. When a Movie Texture is imported, the audio track accompanying the visuals are imported as well. This audio appears as an AudioClip child of the Movie Texture. To play this audio, the Audio Clip must be attached to a GameObject, like any other Audio Clip. 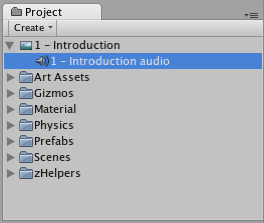 Drag the Audio Clip from the Project View onto any GameObject in the Scene or Hierarchy View. Usually, this will be the same GameObject that is showing the Movie. Then use audio.Play() to make the the movie’s audio track play along with its video. Movie Textures are not supported on iOS. Instead, full-screen streaming playback is provided using Handheld.PlayFullScreenMovie. You need to keep your videos inside the StreamingAssets folder located in the Assets folder of your project. 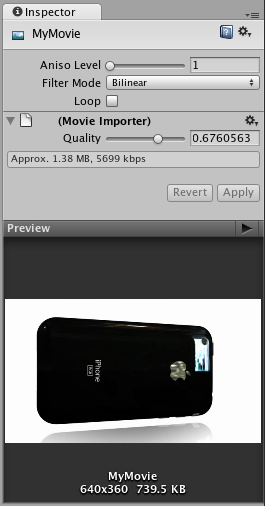 For more information about supported compression standards, consult the iPhone SDK MPMoviePlayerController Class Reference. As soon as you call Handheld.PlayFullScreenMovie the screen will fade from your current content to the designated background color. It might take some time before the movie is ready to play but in the meantime, the player will continue displaying the background color and may also display a progress indicator to let the user know the movie is loading. When playback finishes, the screen will fade back to your content. As written above, video files are played using Apple’s embedded player (as of SDK 3.2 and iPhone OS 3.1.2 and earlier). This contains a bug that prevents Unity switching to mute. The Apple video player and iPhone SDK do not provide a way to adjust the orientation of the video. A common approach is to manually create two copies of each movie in landscape and portrait orientations. Then, the orientation of the device can be determined before playback so the right version of the movie can be chosen. Movie Textures are not supported on Android. Instead, full-screen streaming playback is provided using Handheld.PlayFullScreenMovie. However, device vendors are keen on expanding this list, so some Android devices are able to play formats other than those listed, such as HD videos. For more information about the supported compression standards, consult the Android SDK Core Media Formats documentation.